I recently purchased a couple DIY 4u modules that unexpectedly have power cables soldered directly to the boards, and these terminate with female four-pin power connectors (MTA 100?). Unfortunately, so do the power cables soldered to my R*S boat's PSD. Is there a simple, shrouded male-male connector I can buy to link these two cables? I don't see one on Mouser, but maybe I'm looking for the wrong thing. I'm soldering-averse and would prefer not to break out the iron. Thanks. I don't think there's anything available that would be an easy/good fix for this that doesn't involve using entirely different connectors. It will be easy to remove the wires and solder in the male connector which is the best solution. Maybe ask a friend to help if you don't feel confident. I've never seen such a thing for sale but by a strange coincidence I just made a back to back pair of MTA156 connectors for similar reasons. 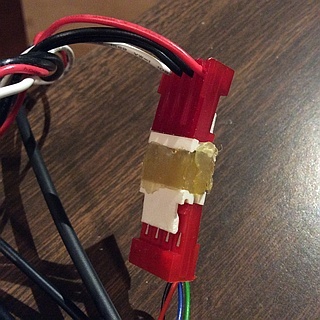 I used a mini vise and hot glue gun with two plugs of the sort you'd mount on a PCB. Put the two plugs side by side close together in the vise (short ends of both plugs close together for soldering jumpers), wire short jumpers against adjacent pins (solder quickly or pins may shift), reposition the plugs end to end, as in the pic, and clamp them down in the vise, fill the space between them with the hot glue for rigidity and insulation. It's the smallest possible frac distro I suppose. In this case the PSU and the device to be powered were both already equipped with a cable. Using this adapter to join them is easier than accessing the back of the module would have been. start with a board-to-board mezzanine connector like this. With only four pins you can slide the middle part or parts to give the length you need for each side into your female connectors. Probably want to wrap the exposed parts in the middle with something to insulate them. Tape, silicone, heatshrink, maybe hot glue. Could just cut this linked connector apart to four pins and remove one of the two plastic bits in the middle per pin. Then cut each of the four pins to the length needed to leave no exposed pin between the two female connectors. Not required, but a piece of large heatshrink, silicone or self-bonding silicone tape will prevent accidental unplugging. Which matters because if it happens at least one side could have exposed male pins. Which may or may not be the active powered side.